These two rings are designed to simply sit on the top of an electric light bulb in a table lamp. The oils are place on the rings and the heat from the bulb will help to diffuse the aroma. 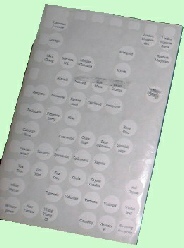 These labels come in two sheets, each of seventy-seven pre-printed round labels to fit the tops of the bottles. They are printed with the names of all but the newest of the essential oils in our range, with duplicates of the most popular oils. They make recognition of bottles in boxes very simple, and help to save time in practice. These plastic, disposable pipettes are graduated to measure up to three mls, and allow accurate counting of drops too. These necklaces come in a variety of colours and shapes and take a drop of oil. The aroma exudes through the unglazed back of the necklace providing a constant release of the oil to the wearer.